Morse Code allows a skilled operator to communicate when conditions are far too bad for analog voice communications. There are weak-signal modulation schemes that can provide solid links when the signal is far below the noise level, but they require computer processing at both ends and often provide only very slow data transmission rates. 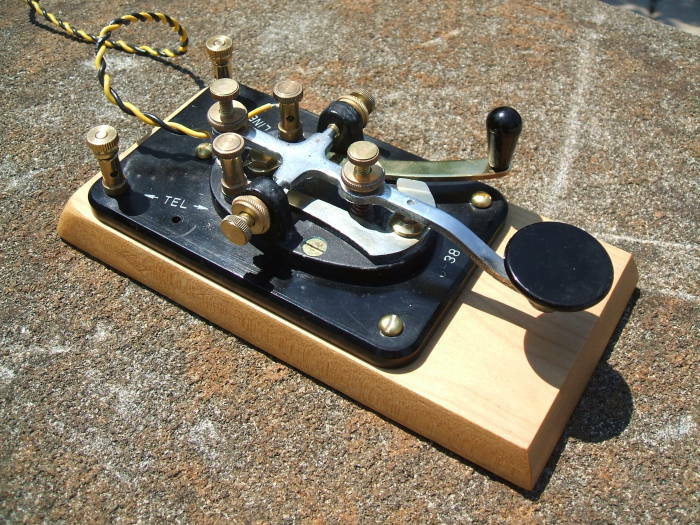 For analog manually-operated communication, Morse code is it! Morse is also called CW, or continuous-wave on-off keying. A U.S. military surplus J-38 straight key, a classic key for brass pounding! A dash is three dots long. The space between dots and dashes within one character is one dot long. The space between letters within a word is three dots (or one dash) long. The space between words is seven dots (or a little more than two dashes) long. There's also what's called the Farnsworth method used in training — the letters themselves are sent at a higher speed with the inter-character and inter-word spaces exaggerated. Maybe the letters sent at 20 wpm speed, but spaced out for a net 5 wpm rate. The idea is to copy the characters themselves at a high speed, but with extra time to recognize each individual character. Once you can copy reasonably well at that speed, the spaces are shortened with the letters left the same, until you're copying at a net 20 wpm rate. Beyond that speed you need to start hearing words rather than characters anyway. The numbers or digits all have five elements, and they are frequently replaced with "cut" versions when it's clear from context that the character is really a digit. You will frequently encounter cut numbers. You will not encounter the accented characters unless you use Morse to converse in languages using those characters. The Wabun Code respresents syllables, as the Katakana and Hiragana characters do. When mixed with International Morse Code, prosigns are used to indicate the start and end of Wabun Code sections. See Burak's great Morse Code Translator for an interactive tool to generate audio and translate between text and code. You can also use it to learn Morse! Also see Wikipedia's page about non-Roman alphabets in Morse code, and this snapshot of Dik T. Winter's page about various alphabets. And, for generating Morse MIDI streams for mobile phone ring tones, see this Planet of Noise page. The Summer/Fall 1982 issue of the National Security Agency's Cryptologic Quarterly included the paper "The Use of Compressed Speech in Selecting Morse Code Operators". Their conclusion is that Morse ability is nearly impossible to predict. The most significant correlation with Morse ability was found to be understanding time-compressed speech.